Rosen was born in Cornwall and grew up on Restronguet Creek. She studied Experimental Psychology at St Catherine's College, Oxford, before moving back to the West Country. She now lives in Falmouth with two imaginary cats, fantasising about getting a real one. In 2011 Rosen was an aspiring author. Writing was a hobby. The following January sales of her Kindle books took off. Her total download count is now approaching quarter of a million. Posted in the thread Can I upload my photo? The feature has been disabled. Where did you find a link that offered you that option please? Seesaw - Volume II was featured in the daily newsletter. Seesaw - Volume 1 was featured in the daily newsletter. Two Shades of the Lilac Sunset was featured in the daily newsletter. Pompomberry House was featured in the daily newsletter. No Shades of Grey was featured in the daily newsletter. Smelly Trolls - The Gamebook was featured in the daily newsletter. Chocolate Making Adventures was featured in the daily newsletter. There are known issues with the site on iPhone and iPad. Really sorry but we have no plans to fix them in the immediate future. Do you have access to another device? London, the Doggy and Me was featured in the daily newsletter. My Granny Writes Erotica (The Original Quickie) was featured in the daily newsletter. Certainly. Please go to 'Author Tools' -> 'Request a Feature' and follow the instructions. The Troll Trap (Smelly Trolls Book 1) was featured in the daily newsletter. 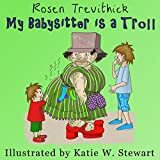 My Babysitter is a Troll (Smelly Trolls Junior) was featured in the daily newsletter. Are you entering the title correctly? Titles must be in title case and not include the genre. Amazon limits the number of times we can pull data from their site. So we probably reached our limit. Admittedly, we could do with some more helpful error messages.